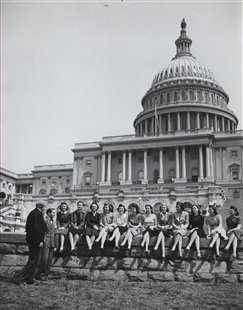 Bonnie Patton (sixth from left), daughter of Representative Nat Patton, was named Miss Capitol Hill in 1941 by the Little Congress. 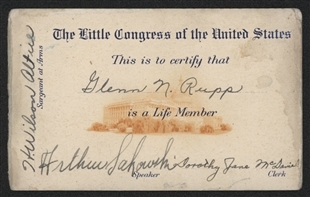 Formed in 1919, the Little Congress was a group of House and Senate staff that met regularly to debate issues before Congress, attend lectures, and increase its knowledge of parliamentary procedure. Patton was photographed surrounded by the other contestants. From the Blog: "His Own Little Club"